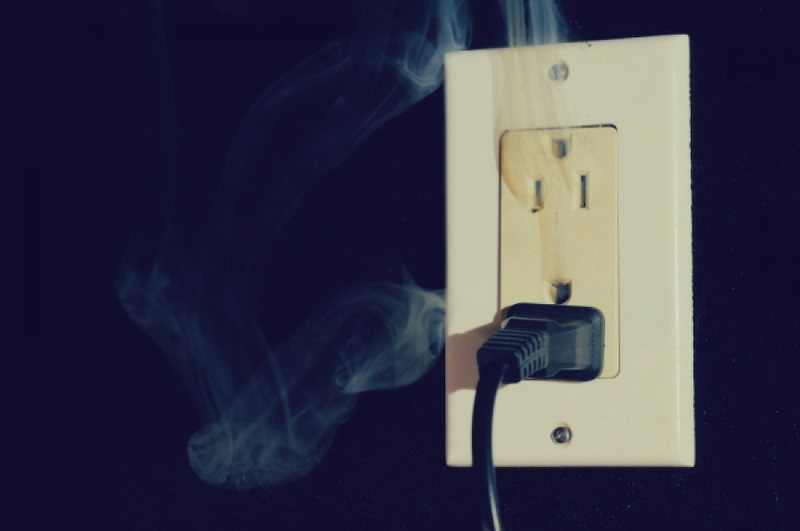 People today are so accustomed to electricity that they tend to forget the dangers it can pose. These dangers are not limited to receiving a shock or jolt as many people believe, but also the considerable risk of fire in the home. In an effort to raise awareness about electrical safety, this article will go over three of the most common electrical safety hazards and how you can prevent them. Keep in mind that you should always contact a certified electrician to avoid any risk of injury. According to a 2013 National Fire Prevention Association (NFPA) report, 63 percent of residential home fires caused by electrical failures or malfunctions in 2013 involved wiring or related equipment. As such, it’s a safe bet that faulty or outdated wiring is one of the most common electrical safety hazards that can put your home at risk. Neglecting to replace damaged or defective electrical wiring can lead to grave consequences including house fires, short circuits, power failures and electrocution. Some causes of faulty wiring include rodents chewing the wires, excessive heat, wearing down with age, stress and corrosion. In order to prevent electrical hazards caused by poor wiring, you should have your wiring inspected by a professional on a yearly basis, especially if you live in an older home. When thinking about electrical safety hazards, your mind may conjure up an image of electricity mixing with water and having disastrous results (i.e. the old chestnut of the toaster in the bathtub). This is likely due to the well-known fact that water can conduct electricity. In the United States and Canada, different GFCI requirements are imposed on businesses and homeowners. GFCI outlets are the most effective way of preventing an electrical hazard caused by water since they shut off electrical power in the event of a ground fault. More specifically, these regulations require GFCI outlets to be installed in bathrooms, kitchens and all exterior areas in every new home. Knowing this, it is important to have your bathroom and kitchen GFCI outlets installed a safe distance away from any water sources, especially if you live in an older house. You should obviously also keep all appliances and electronic devices away from water, whether the bathtub, pool or other area where wetness might be an issue. If one of your appliances happens to get wet, never try to unplug it. Instead, shut off the power source from your home’s breaker panel and call an expert to ensure the situation is safe before turning the power back on. Lightbulbs probably aren’t the first thing to spring to mind when thinking of common electrical safety hazards but they can indeed pose a significant risk, especially in terms of electrical fire safety. This is especially true of halogen lights with a higher wattage than their fixture can handle. Be sure to always check the recommended wattage of your lamp before purchasing lightbulbs. You should also avoid keeping your halogen lights in enclosed fixtures, since they are prone to overheat and can be particularly dangerous when placed near flammable materials. In fact, halogen lamps can produce up to four times more heat than your standard lightbulb. With this in mind, you can opt for LED lighting which dissipates heat and is much less of a safety risk. If you are a safety coordinator or involved in a safety outreach program for an electrical utility company or educational institution, Modeltech offers a range of high-quality safety demonstration products and can even provide training on how to use and present them. If you have any questions about our products or services, don’t hesitate to contact our team today. We will be happy to answer all inquiries.